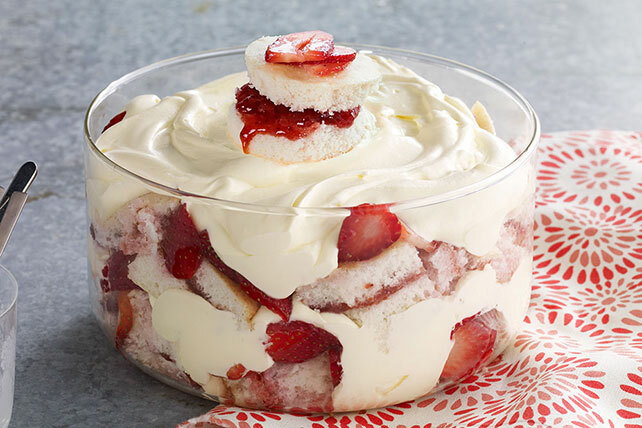 Layer delicious strawberries, vanilla pudding and cake in our Strawberry Shortcake Trifle. This Strawberry Shortcake Trifle is almost too pretty to eat! Prepare cake batter and bake as directed on package for 2 (9-inch) round cake layers. Cool cakes in pans 10 min. Invert onto wire racks; gently remove pans. Cool cakes completely. Meanwhile, toss berries with sugar. Refrigerate 30 min. Wrap 1 cake in Reynolds Wrap® Aluminum Foil; freeze for another use. Cut remaining cake horizontally in half; spread bottom layer with jam. Top with remaining cake layer. Use 2-1/2-inch cookie cutter to cut circle from center of cake; set aside. Cut remaining cake into 2-inch pieces. Layer half each of the cake pieces, berries (with juices) and pudding mixture in large glass bowl; repeat layers. Top with reserved cake round. Refrigerate 4 hours. Second cake layer can be stored in freezer up to 3 months before using as desired. Dessert can be stored in refrigerator overnight before serving.